For the past week, our team at +Irsah inDesigns were approached by a young & ambitious entrepreneur - ask us if we could somehow boost her business blog. 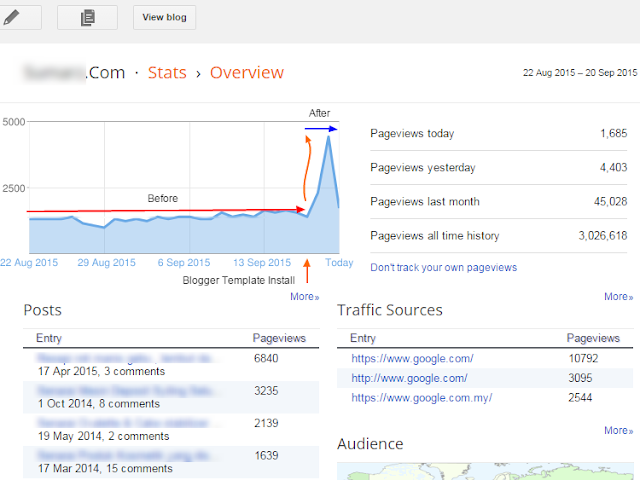 For years her business blog had a static page visits & views between 1.2k to 1.5k daily and felt something is amiss-ed. So we took the time from our busy ( & hectic ) schedule for our blogger store template gallery downloads at http://sellfy.com/irsah to attend her needs. After some useful email conversation, exchanging ideas & investigation on what would probably the cause of her business blog ordeal ( the pageviews/page visits ) we brought the idea to change her Blogger blog theme since that it was not properly set-up with untidy codes, too many external plug-in references - something you may expect from Blogger template designer galleries (& directories) from that other part of blogsphere world. Deep into our discussion, she had some designs in mind, sent us a few examples & it did not take us long to develop a responsive, sleek, one of kind blog template to house her business blog. Voila! With a new responsive Blogger template framework, loads of custom widgets (which she could also use default Blogger widgets too ) & a lot of customization needs without changing (or touching a single code ) - in minutes the blog template transition commenced. After a couple of hours (less then 24 hours to be exact), her business blog page views/page visits shot up 266% to the highest peak at 4.8k for 3 days in a row. In conclusion, transitions between your Blogger template can be done without hurting ( that much ) your existing blog statistics. Using the correct & optimized Blogger template ( including the right technique for theme transitioning ) - will really help boost your blog hence providing you free promotions ( for business blog ) in search engines result pages. As always, do not expect templates/themes downloaded from Blogger template galleries ( free or paid/premium ) is that to be expected ( or written to do ). From our past experience working with Blogger users, these template downloads has the worst theme ( & coding ) practices ever to exist on the internet planet - we have proof both free & paid templates provided by top Blog template galleries available not just eating our words.